Are you ready for Spring? As warmer temperatures approach, it’s the perfect time to give your home a facelift and welcome the season with a new look! A fresh, new entryway will be the perfect change to rejuvenate your home – and a new front door from Doors of Elegance can make all the difference. Learn more about the importance of your front door, door upgrade options, and then see the difference for yourself with our before-and-after pictures! Your front door will be the first thing you and your guests see when approaching your home. As the entryway, it represents the type of welcome you want to give and makes a first impression. Will it be a warm welcome? An impressive one? Or simply an elegant, understated one? While an eye-catching color like red can work well in some instances, color is not all there is to a welcoming door. The general style of the door, the materials it’s made from, and the little details on it also contribute to the overall aesthetic. Beveled glass doors have panes of glass which are set in the frames of the doors. The frames are made out of different kinds of wood including, our favorite, rich mahogany. Combining form and function, these doors are insulated to help your home maintain its energy efficiency while having a beautiful, eye-catching appearance. With over 70 designs to choose from, there are many unique features. You may opt for one with designs etched in the glass, twin rectangular panes separated by panels of wood, or panes of glass in the shape of arcs, circles, or ovals. The designs can get elaborate or keep it simple- it’s up to you. Compared to cast iron, wrought iron has less carbon and is popular due to its malleability. 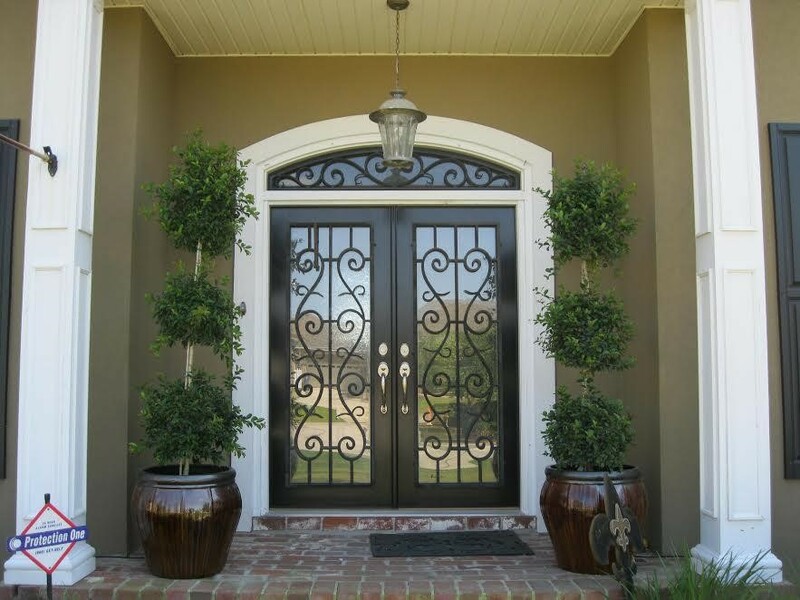 At Doors of Elegance, you have more than 100 wrought iron door options to choose from or we can custom design a unique door to fit your own style! You can have one that’s primarily made of wrought iron, or one that includes other materials like wood or glass. Doors that are completely made of wrought iron are usually paired with a second inner door for a completely sealed entryway. For a single door, glass and wood are usually combined with the wrought iron. Doors primarily made of wood usually have intricately crafted inclusions of wrought iron in the shape of loops, curves, triangles, squares, and rectangles. Mahogany is an elegant wood that often represents style and quality. With a deep mix of reds and browns, it’s a durable option that looks better as it ages (like a fine wine). Our mahogany doors come as panel doors, carved doors, mansion doors, and divided light doors. Panel doors come in vertical or horizontal panels, while other designs include beautiful glass panels. Carved doors have ornate designs carved right into the wood itself, handcrafted by fine master carvers. Divided light doors invite more light into the home and can help to change the mood of your whole house. Mahogany doors can definitely help your home stand out! There are simply too many designs of doors to describe. If you don’t have an idea in mind yet, take a look at our collection of doors for inspiration. Browse our entire collection and contact us to get started!